Home / Celebrities / WATCH: Prince William finds his (very awkward) dancing feet! WATCH: Prince William finds his (very awkward) dancing feet! I never pegged myself as a royal watcher but this is just soooooo adorable… I might actually feel pity for Prince William if I wasn’t laughing so hard! 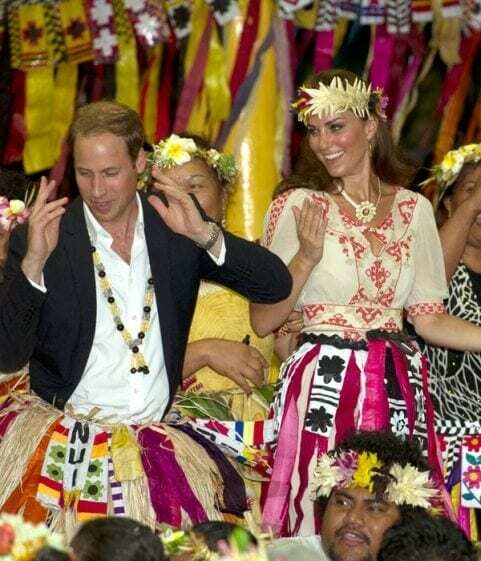 Seems like the royal duo’s descent into casual attire encouraged the locals’ of Tuvalu, a Polynesian island that’s north of Fiji, to whole-heartedly pull them into the evening’s feast celebrations. And while Kate, true to form, managed to follow most of the directions gracefully, it’s Will who wins my heart with his ultra-cute, completely uncoordinated combo of some weird take on jazz hands, karate chops and general I-don’t-know-what-to-do-with-myself movements. Totally awkward and completely adorable! Oh! And just in case you are wondering why Kate seems to be fumigating everyone, she is just keeping up with the Tuvalu tradition for visiting dignitaries to bring a fragrance of their choice and spray it on the dancers they like. The royal couple brought Paul Smith London for Men (do you think it’s what Prince William wears?). Now, wouldn’t that be a sight worth watching 😉 What’s the most fun-yet-awkward local custom you have ever experienced? Tell me below! SOOOOOOOOOO cute… for the first time I can understand why they would marry each other!